The weather's been a bit hit and miss this week but that doesn't bother Brits Bingo who have a Seaside Special this weekend. Visit the 75-24 Under the Sea room between 8pm and 11pm and you can win £30 every 15 minutes. Bingo on the special Seaside patterns FISH, TURTLE, S-E-A and STAR to win. Tickets are very reasonable at just 10p each so why not enjoy a few games or try the Mermaid's Pearl slot game where the top 5 players who win the most, will get £25! The Cruise Alaska bingo game will play tomorrow so grab your tickets now if you if you fancy a 7 day cruise to Alaska plus £2000 spending money, don't hang about as this is your last chance to get tickets for the game and who knows when the next Cruise or holiday promotion will run. If you know what the mermaid's name in the Disney film, the Little Mermaid is, send your answer to [email protected] where 20 players will be selected at random to win a £5 bonus prize. 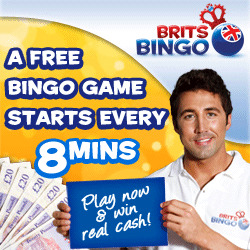 Right now you can play for £200 in free bingo games every day making a gigantic £6000 in free jackpots every month! Funded players can play in these bingo games which offer a guaranteed £10 jackpot every 15 minutes between 3pm and 7pm in the Free Bingo funded room and £1 jackpot in the Free for All room between 7am and 7pm. Brits Bingo offers new members £1 free bonus when they register, as well as 200% first deposit bonus on deposits of £10 to £200. Regular depositors will also receive 50% bonus on their reloads on between £20 and £100.